Baby Nautical makes his blog debut! I am so excited to have Tanya of the Coral Cove guest posting on the blog today! Tanya is an interior designer, specializing in nautical decor. A nautical theme is timeless and is an ideal choice for a dinner party, whether you live near a large body of water or you daydream about seaside living from somewhere landlocked. From birthday celebrations to going-away parties, nautical-themed events are popular for their versatility, because they can be adapted to fit nearly any venue. Furthermore, the style of your dinner party can range from extremely formal with a cruise ship atmosphere to informal, like a backyard picnic or a clambake on the beach. In most cases, your location will determine your décor. For instance, if your dinner party is taking place on a boat or at the beach, you don’t need to do much decorating. Rather, you and your guests can enjoy the natural beauty of dining by the water. On the other hand, when you’re entertaining at home, you can bring the seaside atmosphere to you using nautical colors and accessories on your table. If you plan to send out invitations for your dinner party, you can either purchase them or make your own. For convenience, there are numerous businesses, both online and in traditional retail locations, that sell nautical-themed stationery. Creating your own invitations allows you to convey the theme and atmosphere of the dinner party. Some popular ideas include paper decorated with boats or beach scenes, as well as a mini “message in a bottle” invitation. Do you want to recreate a fancy cruise ship dinner? If so, then encourage your guests to dress up. Otherwise, they can wear casual beach attire. Be sure to indicate the party’s exact location on the invitation, and whether the dinner will take place indoors or outside. Regardless of whether you have a simple or formal dinner menu, you have a variety of traditional dishes from which to choose. Lobster, clams and other seafood are standard fare. A basic casual menu for a picnic on the beach could include a shrimp cocktail appetizer, followed by a seafood chowder, and a clam or lobster bake. A formal sit-down dinner usually entails a more elaborate menu, such as shrimp cocktail and seafood bisque or clam chowder as appetizers, followed by a baked, grilled, or broiled dish, such as flounder or salmon. Bread and salad are two simple accompaniments. Don’t forget drinks and dessert. Your beverage selections might feature teas, lemonade, and other summer beverages, while a more formal dinner could include wine or champagne. Cake, cupcakes, cookies and other pastries can be decorated to go with your theme. You could also serve something simple, such as fruit, for a casual picnic. Decorating the dinner table is your chance to pull out all the stops and show off your creativity. Some common nautical objects to incorporate as centerpieces and accents include lighthouses, model ships, bottles with messages or mini ships inside, seashells, sand, sand dollars, starfish, assorted candles, and lanterns. 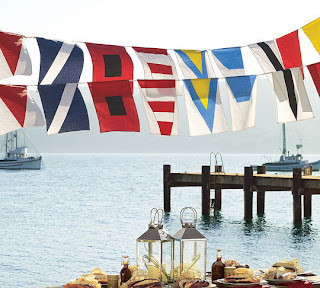 You can alternate striped and solid napkins in nautical colors and use a coordinating table runner. Like your other decorations, the style of your serving dishes and accessories will depend on the event’s formality. A picnic on the beach requires only the bare minimum as far as serving; think large metal buckets or shell-shaped serving platters. For lighting, consider using tiki torches or hanging lanterns. For a successful event, start with the basic suggestions given here and add your own personal touches. 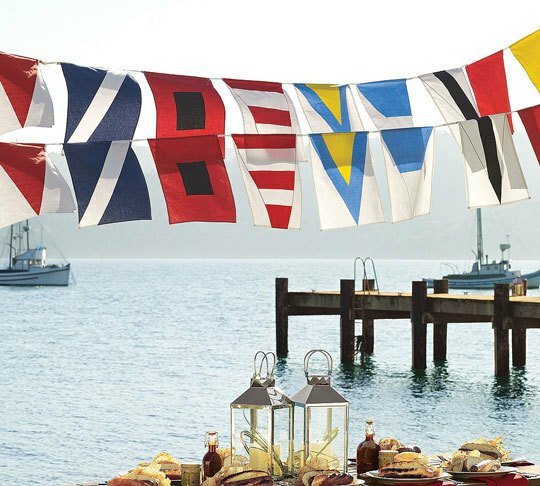 Given most people’s love for the sea, your nautical-themed dinner party is sure to be a hit with your guests! Don't forget to check out the Coral Cove for nautical decorations, furniture and accessories! how have I, of all people, never heard of this website!!! Totally checking it out!